DIY Organization Projects Print this Project! "Organization has a major moment every time spring finally rolls around, but this year, it seems to be something bigger than an annual chore—something more like a ritual." Organization has a major moment every time spring finally rolls around, but this year, it seems to be something bigger than an annual chore and instead, something more like a ritual—one that helps us bring peace and calm to our minds and bodies and homes. (Thanks, Marie Kondo!) I’m here for the new spring cleaning energy, and I’m using it as an excuse to share five of my favorite spring cleaning projects that’ll hopefully help make your spring organization ritual better than ever before. While spring has technically arrived, we’re still in that weird limbo—some days it’s snowing, other days it’s 70-something and sunny. That said, a lot of mud and slush is being tracked around, and our rain boots are still making a regular appearance. 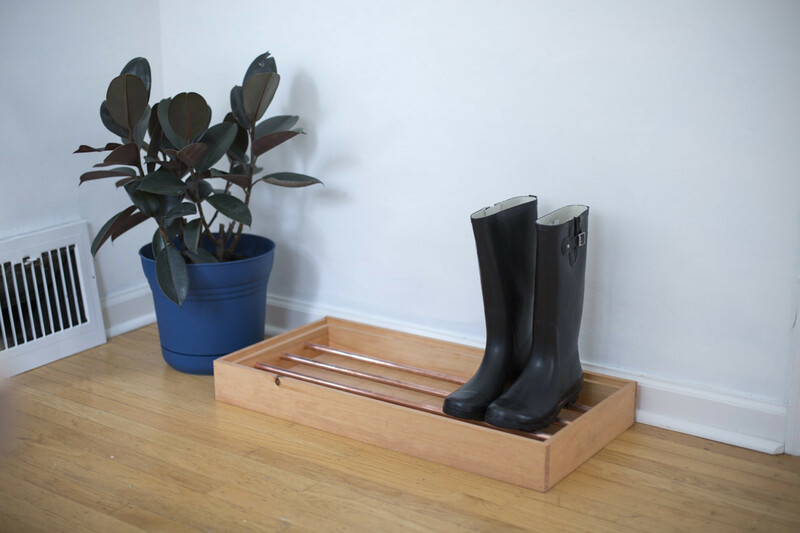 I love this copper pipe boot tray because it’s compact enough to fit in even the smallest entryway, yet is still large enough to hold pairs of shoes (and you can always customize it to fit your exact space). Plus, it looks good, is affordable, and takes all of two hours to put together. One of the best ways to make the most of a small space is to think vertically. 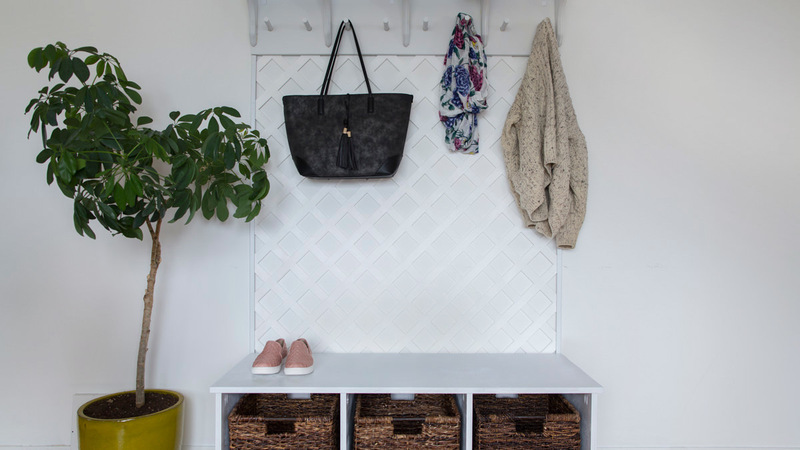 That’s what we did with this lattice coat rack, which scales the wall and features a small shelf and a series of pegs for storing everything that’d otherwise wind up tossed on the floor or haphazardly stashed in the closet. With this coat rack, you can keep everything handy, tidy, and in plain sight. We’ve all been there—hopping around on one foot, trying to put the other shoe on. An entryway bench like this pulls double duty as a place to sit down as you’re getting ready to head out the door and a place to store shoes and other accessories. 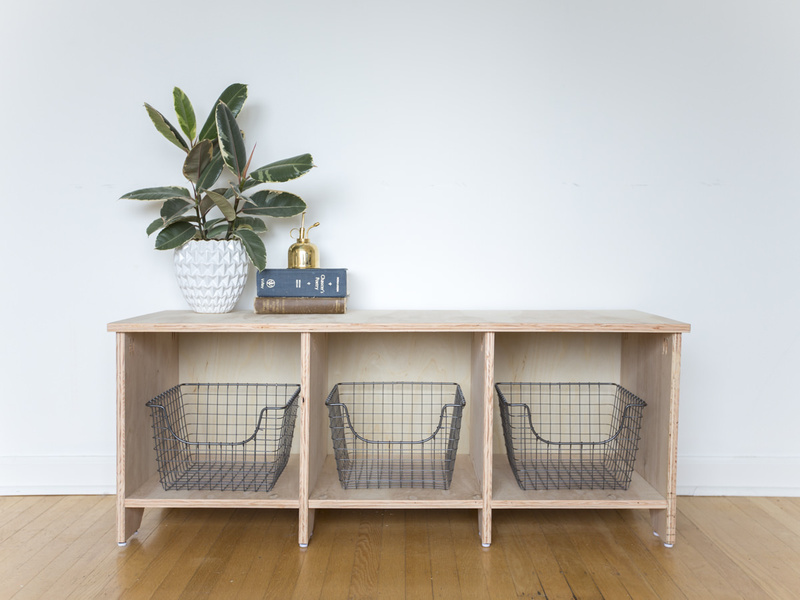 You'll love the built-in storage cubbies—which are big enough for a wire basket. Speaking of storage benches—you can leave the bench above as-is, or you can add some comfort by sewing a bench cushion to sit right on top of it. The best part about sewing your own bench cushion is that you can personalize it so it matches your decor. You can even use leftover fabric to make throw pillows for your couch or your bed. 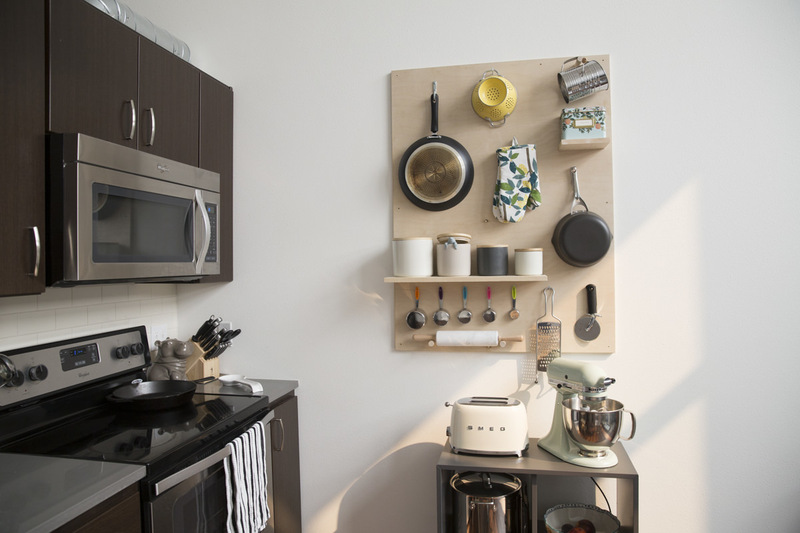 A storage pegboard can be a total lifesaver in a tiny kitchen or a kitchen with limited cabinet space. It's a great way to take advantage of otherwise-unused space and to get stuff off the floor. 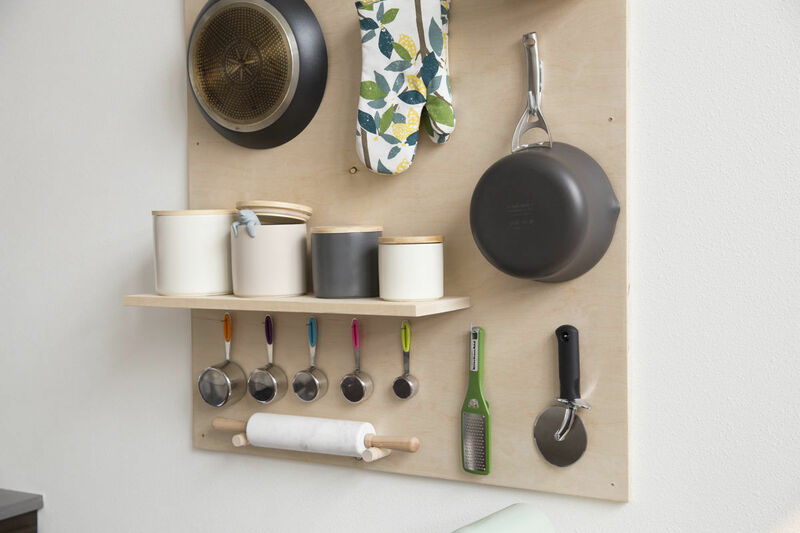 And, beyond the practicality of having everything within arm’s reach, a storage pegboard looks pretty—I love having my favorite kitchenware properly arranged and on display. Looking for even more ways to get organized? 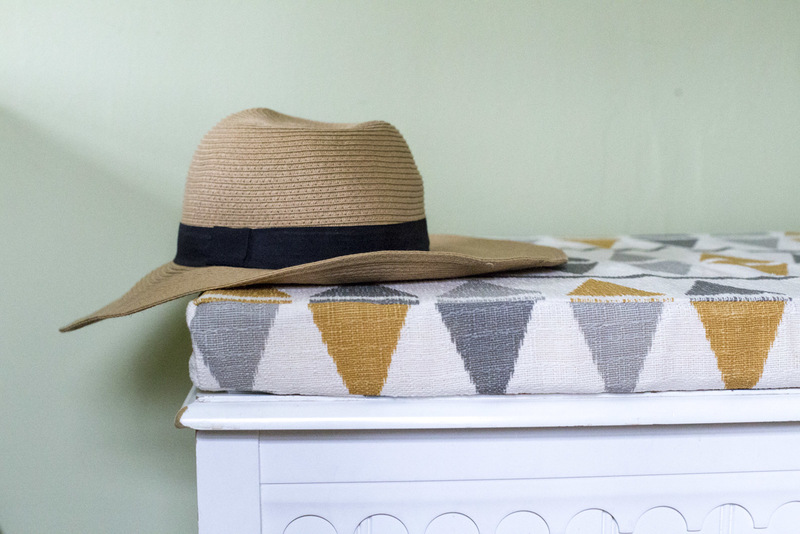 Check out our simple tutorials for making a DIY Throw Blanket, a Shoe Rack Storage Bench, and a Bulletin Board. A hobby horse is a timeless toy that you can make in a few easy steps using a simple materials—and it makes for a great gift! A wooden Christmas tree is a festive, fun alternative, which can be customized to fit any space. It even folds flat for easy storage!